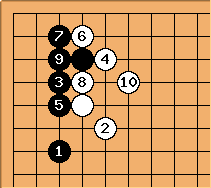 I would like esteemed senseis to comment on the following two joseki well known to you. Black chooses between the two on playing 1 (other variations have to be considered, too). Both are joseki, which means that both variations consists of good moves. Yet my impressions about them are contradictory. When I look at the result I feel that Black did better in the second case. When I think about the games that I played as White using joseki 2, they were not more difficult than in the case of joseki 1. Vice versa, my memories of joseki 2 are rather favourable. So, can anybody comment on the variations? 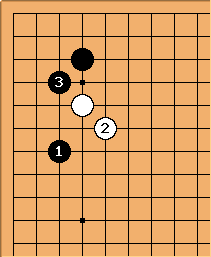 White's choice of the high approach move. Black's choice to attach underneath with 1. White's decision to play hane at 2 rather than, for example, playing the nadare joseki. 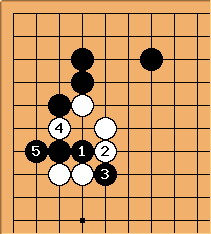 White's decision to make the solid connection at 4 rather than the hanging connection or possibly playing tenuki. Black's decision to play the low extension at 5 rather than the diagonal move (not to mention the decision not to pincer White on the left rather than extending at the top :-). 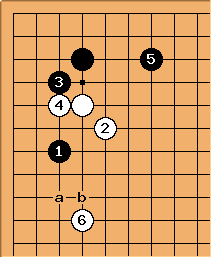 White's decision to make the low extension at 6 rather than the high extension (Takemiya style). 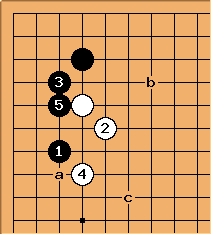 or Black's playing the low one-space pincer. 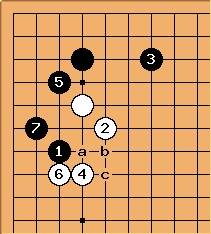 White's decision to play the high diagonal move at 2 rather than, for example, hitting under the kosumi stone. Black's decision to play the two-space extension at 3 rather than perhaps attaching against the diagonal play. 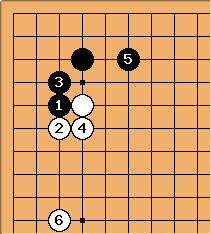 White's decision to play the press at 4 rather than attaching under the kosumi stone. Black's decision to connect underneath with 5 and take the corner profit rather than playing one space above 5 with the intention to play another forcing move from the bottom if White answers at the top. When you look at all the turning points that must be gotten over in order to reach these two positions, it seems almost impossible to consider them in terms of "either A or B, which is better?" Rather it is more like, "Out of the 50 different variations we have just looked over, which one most strikes your fancy in this game?" HolIgor: I asked this question because the second joseki does not seem equal for me at the first glance, though my experience tells me that the games in which I use it are not more difficult than others. I have no reason to complain and thus my first glance judgement is not correct. It is this mistake in the first glance judgement that worries me. 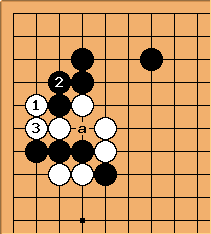 In the case of joseki 2, Black gets a lot in the corner while white stones are floating. They are not heavy yet, but they don't have a base. White's position looks quite scary, and yet, my score with this joseki is positive. Now, let us consider some deviations that happened recently. Black played 3 and I did not like the idea of playing at 5. It seemed to me that the group becomes heavy in this case. So, I played 4 and the opponent played 5. Now, it is useless to press on the group in the corner. White has to be content with pressing Black to the third line here. So, what is the next move? Without support from in the lower left corner a seemed too slow. At the same time compared to the main variation Black did not extend at the top, so perhaps a move in that direction is good. I played b not thinking much about the precise placing of the stone. c did not even occur to me in the game. Now, I have Ishida's dictionary in Japanese. But I can't read Japanese and that is the problem. Black 3 is there and the variations are not marked as recommended. There are two diagrams which I have to interpret. I don't know what Ishida says about it but I don't like this for White. I believe this is what Ishida suggests for White to punish a suboptimal Black 3. Note 5, a funny move, isn't it? First, this is the 'standard' starting point when Black plays 3 in answer to 2 and White chooses to hit at 4. There are various alternatives both for Black and for White along the way to this position. Personally speaking, I have never played this in a game. In my case almost all my opponents have played a in answer to 2. In this position White has achieved her aim of playing 6 in sente and Black has taken a lot of territory in the corner. As Ishida says (in the old English edition not the new Japanese-only one :-), "In the local context this is a loss for White, as Black has a lot of profit. White can only play like this when (6) is a very effective move." What dissatisfactions might Black have here? The natural one in this position is the inability to push up with 1. If Black exchanges b for a, his two stones are short of liberties when he tries to cut at c. Dieter doesn't see this. So his original pincer stone is virtually worthless. This together with allowing White to set the pace on the left side should leave Black searching for something better. What now ? I admit it is brutal but White is cut. So, what is probably meant is that the cut is not as severe in this situation, because of the nice hane at 4. Charles Matthews Can Black really tolerate this? After White 3 Black cannot immediately cut at a.
Dieter: I guess my question suffered from the same reason for my losing streak at KGS: a, hopefully temporary, drop of reading ability. After some days have passed, I'll post this as a Beginner exercise, to chasten myself. unkx80: Perhaps slightly more than a beginner exercise. I'll make it Kyu Exercise 74. 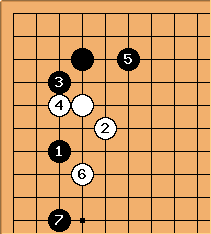 Conceptually this is the next step in developing the joseki. Black switches to this 5 with the intention of playing 7 in answer to 6. Remember that White has chosen the variation of 4 because 6 is a very effective play in relation to the lower left. However, 7 changes the situation greatly and Black can easily push up and cut with Black a, White b, Black c. White pretty much has to protect the cut and therefore loses sente. Since Black has still secured a large corner, Black's new variation prevents White from carrying out her plan. 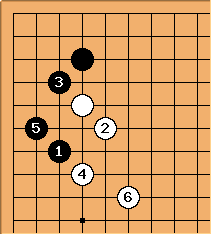 When Takagawa first played this pattern with 5 in a top-flight game, his opponent Shimamura Toshihiro answered once at 6. Black then extended up to 7 from a position in the lower left corner. 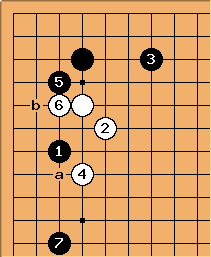 In Ishida's words, "Having answered once, it was too submissive to answer again, so Shimamura switched (away)..." If Black later plays a, White plays b. 4. Black sets the pace? Since I don't have the newer edition of Ishida, I don't know what he says about this idea but it looks like a natural try from Black based on what we have seen above. White can't take advantage of Black not playing at the top. After something like this, White's original diagonal move at 2 is badly positioned and almost wasted. Also realize that against the one-space low pincer, if White wants to build influence toward the right she usually plays 2 at 9 to start with. 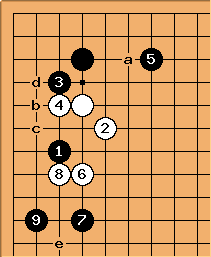 Obviously 5 reverts to the earlier pattern where White probably has nothing better than continuing at 6. It would be interesting to see whether the new edition of Ishida comments on the choice of a instead. Since Black is likely to play b, White c, Black d shortly, I can't see a reason not to go as far as 5. 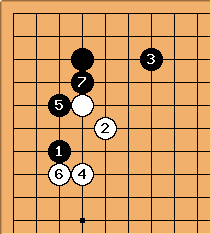 After 6 in addition to Takagawa's move at e, Yamabe's dictionary gives the possibility of 7 and 9 after which White can really feel herself to have been pushed around! The point of 7 is that it virtually forces 8, since allowing Black to play there instead would be unbearable. xela: Would here (or at a or b) be a crazy idea? Dieter: I believe has gone completely out of fashion with the pros, precisely for the above stated reasons. xela: How recently did it go out of fashion? Gobase tells me that Yamashita Keigo played it in December 2006, and there are five other recent (since 2005) games.